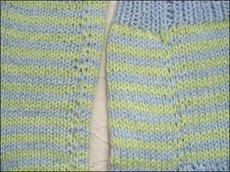 Last week, after arriving home from Italy, I finished both the Spiral boot socks and the striped socks for Hanna. 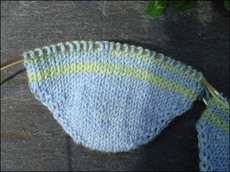 They both went blocking, and came out with smoother surfaces and clearer stitches. In the striped socks I knitted for Hanna I tried two different ways of making the rounds more jogless. Under the foot I used a method of knitting the first stitch of the new colour with both colours, and then adjusting the unwanted colour stitch on the next row. This creates a pretty straight line, but it is, as you can see, hard to keep the tension even. On the inside of the leg portion (this sock pair is having a left foot and a right foot, both with the jog on the inside of the leg part) I used a method where you knit the first row of the second colour just like normal, but on the second row pick up a loop the first colour and knit it together with the first stitch of the second colour. The tension was easy to keep up, but I don't think the jog is as good. Or perhaps I knitted something wrong here? I have a feel it's not looking like it's supposed to. So please, since I feel neither of these methods is perfect, if you do know about a better way to avoid the jog, would you like to share it? I would really appreciate it! 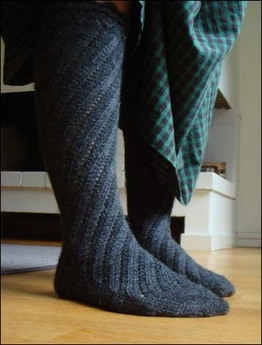 These socks were also knitted using the magic loop technique. 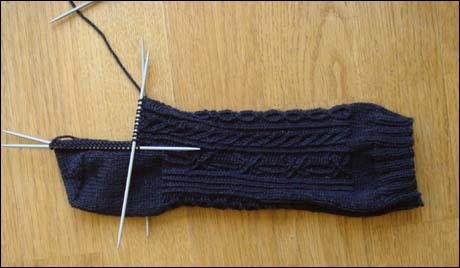 It is the first time I have used it for completed socks, before this I have only used magic loop for the toe portion. And I think it will stay that way. 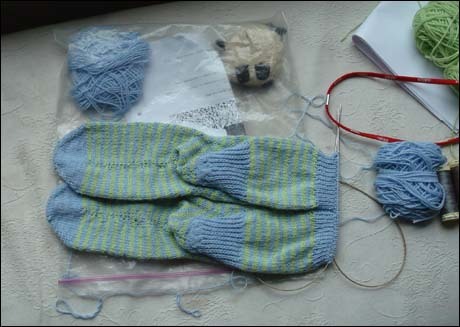 The heels were fussy to make on magic loop, and there is clear signs in the sides of the socks were the rows have started and ended. 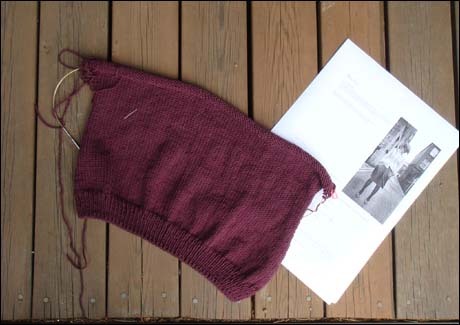 Since I never get any marks when knitting with the old-fashioned trusty double-pointed needles, and the speed is also of quite an other world, I think I will stick to the dpns for the future. And use magic loop for toes only when I'm starting socks that way. 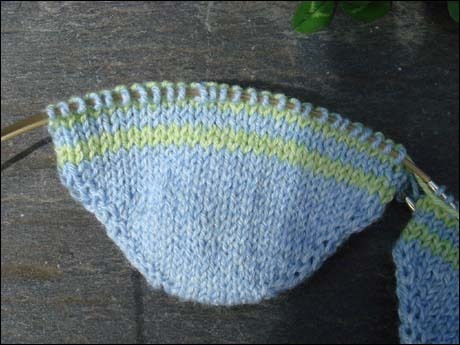 Pattern: my own, knitted from the toes up using magic loop. 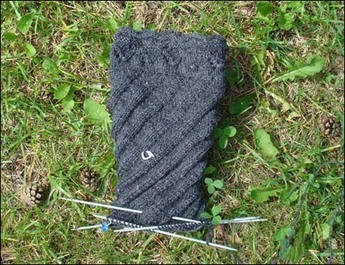 A basic way to knit toe up can be found here. Yarn: Regia cotton sockyarn, 41 % wool, 34 % cotton and 25 % polyamide, about 75 grams. Needles: 2,5 mm addi circular needle. The Spiral boot socks then? Finished with the knitting and blocked. They still need some kind of elastic or perhaps a beautiful ribbon would be enough in order to stay up. The lace in the cuff is too elastic to stay up without any help, and my leg not shaply enough. 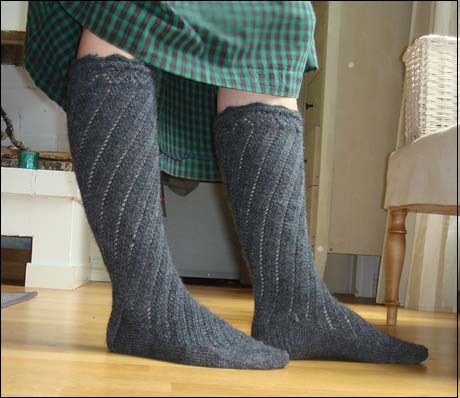 But the socks were funny to knit, and I think the pattern is pretty cunning, the way it looks like there is only one pattern on the leg. 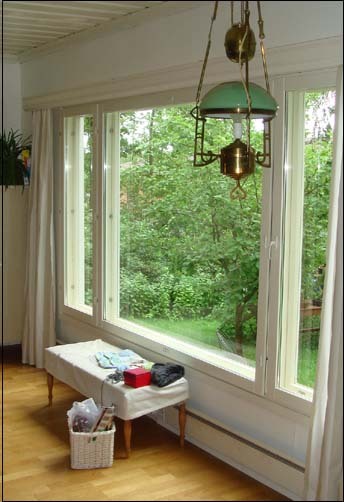 Click here to see a picture where the decrease points are marked with two lines! If you look closely you can see were the decreases are made, but when you just look in a normal way, they look like having just one pattern. All in all it is a very well fitting sock, the foot is just perfect for me. Pattern: Spiral boot sock by Evelyn Clark for Interweave Knits Summer 2007. Yarn: Novita Nalle (a Finnish sock yarn), 145 grams. Needles: 2,5 mm double pointed needles. Before starting our trip to the archipelago on Monday I dug out three balls of Regia Silk in a denim blue colour, 2,5 mm dpns and Nancy Bush's Folk socks book. The pattern I chose is the Chalet socks, with it's roots in the sock pattern with traveling stitches found in Bavaria, Tirol, Alsace and Norway. I once lived in Munich and stayed with a family very fond of the traditional Bavarian way to dress, and since I have liked the traveling stitches in socks very much. 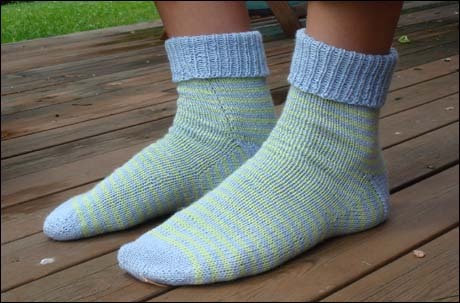 I in fact found not long ago a very traditional pattern, but since it will look better in a light coloured yarn I decided to let that pattern wait a while, and I chose the chalet socks instead. In this pattern there is something as unusual as mistakes in the charts. 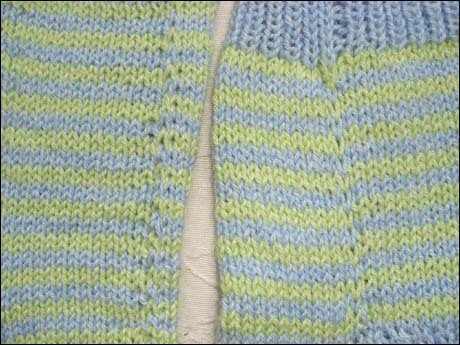 The center pattern should start with two twisted knit stitches that on row number two are crossed. This way you'll have circles that every second time twist around once and every second time twice. The way the pattern is charted was very hard to understand in the beginning, not being like what I'm used to, but I'm starting to get the grip of it. And now the knitting flows, I'm past the heel already. Look look! I hope you'll have a nice day, filled with laughter and joy! I'm now off to clean the house, tackle the last of the archipelago wash mountain and do some work in the garden. We are home again, trying to adjust to the weather and the normal life. There are so much to be happy for here, the favorite knitting spot by the window with a view over the garden, the well equipped kitchen with all the familiar utensils, the ability to have a conversation in a shop in Finnish or Swedish, and knowing the other part understood everything, instead of those mixed conversations in Italy-German-English, where there were no guaranties you message went through or were understood (I think this feeling was mutual). But there is also so much to miss, the fabulous weather (it's raining here), the fresh fruits and veggies, so much riper than here, sweater and fresher, the beach and the sea, the feeling of no worries you have when you're just a limited time in one spot, and can forget about all the problems (like broken computers) you left behind at home, and you're just hoping will magically solve them self in your absence. As usually, they don't, they wait you out, and then pop out their ugly heads when you turn the home key around. And Italy, I already miss you, the country, the people, and, surprisingly, the language, that I found for the first time very interesting. The flight home went well, the children are so happy, and I have washed the mountain of dirty clothes we had with us home. 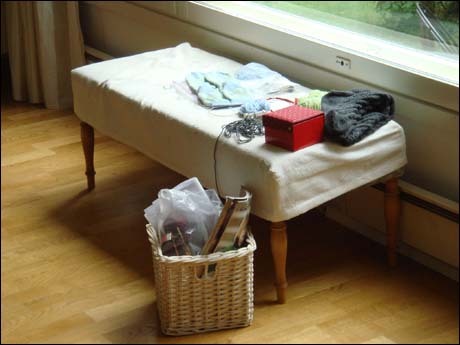 Nothing were unintentionally left behind, and there is a load of happy memories back with us home. I'll post some more pictures when I have sorted them up. The stripy socks were almost finished in Italy, and when I came home I hungrily grabbed the Spiral boot socks, finishing the first and happily knitting away on the second, finishing that one too in almost no time. They are ready for blocking, and I have NO pictures of the process. I can't believe I just knitted away on them. You can see the socks on my knitting spot above, on the right side. More pictures as soon as I get them blocked! Now I only have to put my act together and finish the striped socks, the socks containing so many summery memories. I only hope for a day with sun, it feels silly to knit these when it's pouring down outside. It doesn't feel right, let me tell you. But they looks very promising, the fit on Hanna's feet is almost perfect, and there is just a couple of centimeters on the cuffs left. The colours remind me of Italian ice-cream, available in more different colours and tastes than I could ever imagine. I don't know why this is a new experience, I have had ice-cream on every Italy trip I've made before, but of some reason it hit me stronger now than ever before. One of the first days I was staring at a huge ice-cream assortment, only to realize it was only one third of what the gelateria had to offer. Wow! I tried two different ways to make the stripes jogless, and I'm very much looking forward to see which one is better after blocking.